Indeed, some of these options are terra incognita, unlike the most effective, cost-relevant, and undisputed means to decrease imports and secure supply in the heating sector – namely energy efficiency. According to a 2013 study by the German Energy Agency (DENA), by 2020 energy efficiency measures could cut Germany’s final energy consumption in the heating sector (covering all sectors and energy sources, not just natural gas) by 16 percent. 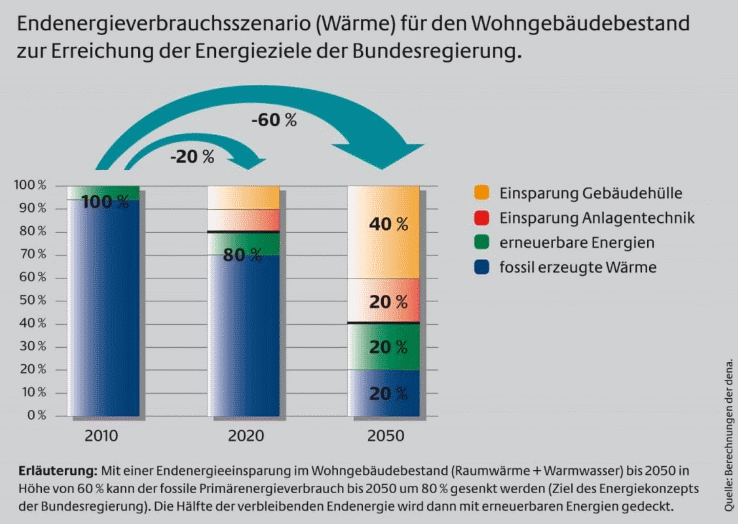 DENA estimates that by 2050, Germany could reduce its heat consumption in residential buildings by 60 percent, while renewables could cover another 20 percent of 2008-based consumption (see graphic).